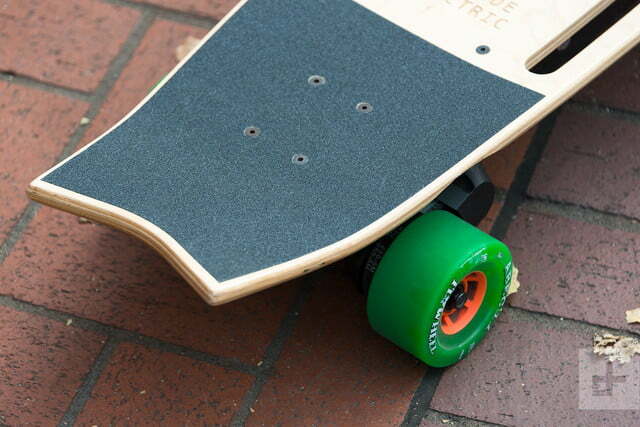 Riptide's righteously rippable R1 Elite makes up for its mediocre motors with a drool-worthy deck design. Electric skateboards have made vast improvements in efficiency and speed, but improved tech specs don’t necessarily make for a fun ride. 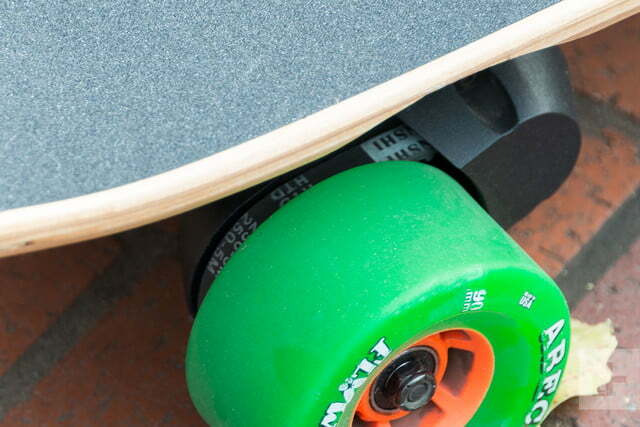 What does makes for a fun ride is offering up something special that no other electric board has. When we started our review for the Riptide R1 Elite, we realized right away this electric board had that special something. 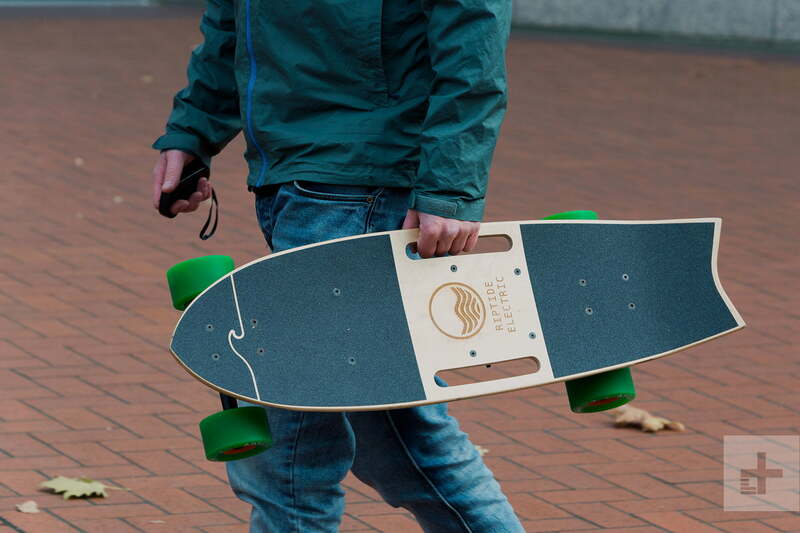 Riptide saw the potential in going back to basics, and the result is a wonderfully simple board that can stand toe to toe with some of the titans of the electric skateboard scene — even with its flaws. At first glance, there’s nothing particularly unique about the R1 Elite. 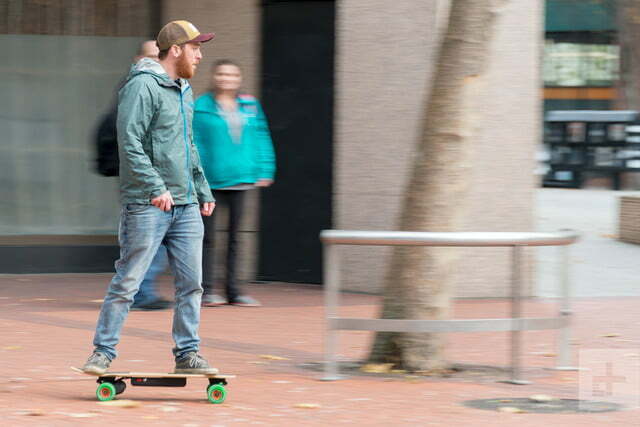 Like most electric boards, the Elite has a max speed of 20 mph, and a range of 8 miles. At $729, its price tag is notably lower than other high-end electric skateboards, but that’s not the key difference that makes this board worth buying. What’s immediately clear when you ride the Elite is that it was built by actual skateboarders. Case in point: the kicktail. 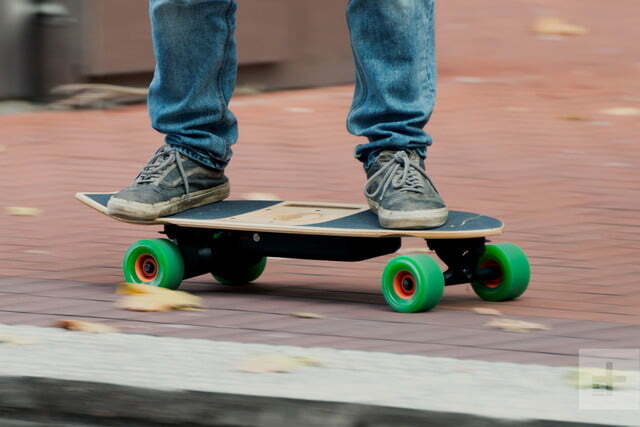 Having a kicktail means you can take sharper turns and maneuver through busy streets and sidewalks easier than with other electric boards. But a kicktail isn’t any good if the deck it’s built on is low quality, and fortunately that’s not the case with the Elite. 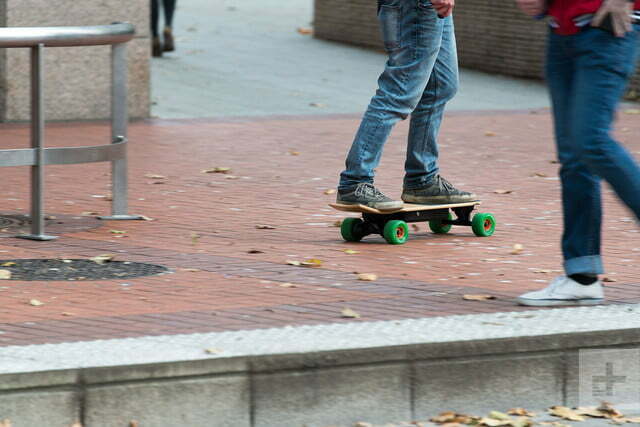 The deck feels sturdy under your feet, and even though the board is heavy thanks to the battery and motors attached to the back wheels, the weight is evenly distributed, and every ride feels smooth thanks to the Abec 11’s attached to the board. 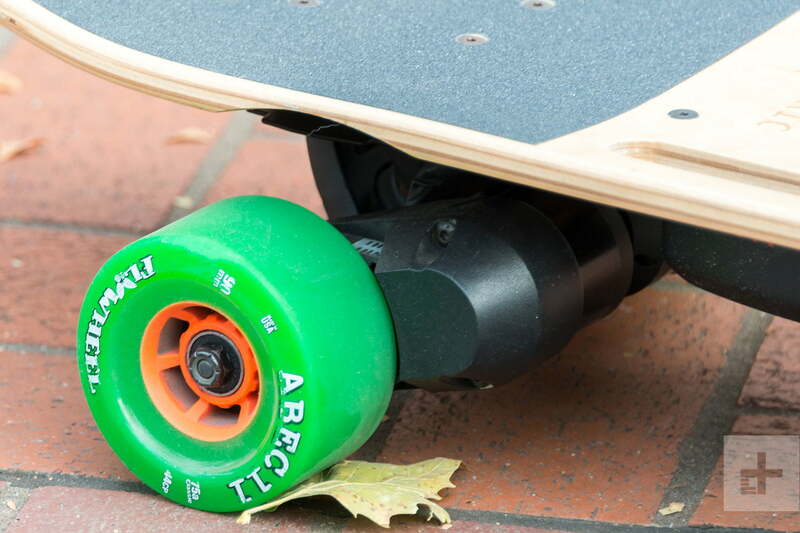 If you’re not familiar, Abec makes some of the best skateboard wheels on the planet, and the 90mm, soft urethane wheels attached to the R1 Elite are ideal for going over everything from the occasional twig to cracks on the pavement. 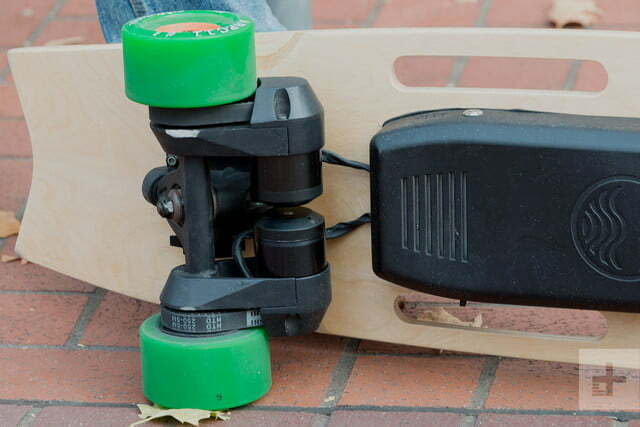 Like every other electric skateboard, you still can’t swap out the board’s back wheels due to the way the motors are affixed to them, so you’ll have to reach out to Riptide if your Abecs get damaged and you need help replacing them. At 14 pounds, the R1 Elite is pretty much the same weight as most electric longboards, but with one big difference: it’s way easier to carry. 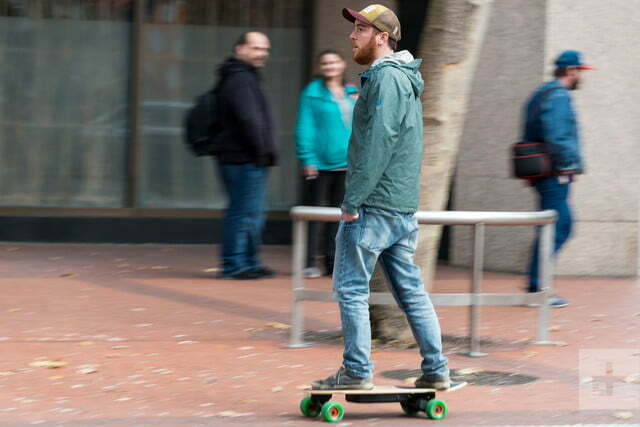 Because of their bulkiness and weight, it’s often a chore to carry around electric boards, and for people who like to take their board everywhere with them, that inconvenience can sometimes become a deal breaker. Luckily, Riptide sidestepped that problem by putting a handle on each side of the deck, which makes it way easier to hop off and carry the board whenever needed. 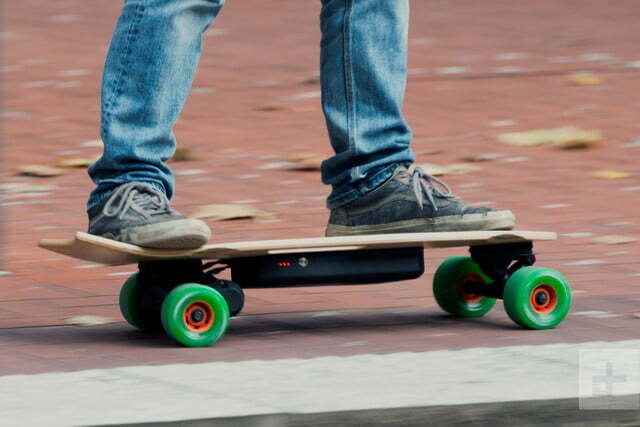 Along with the deck only being 31 inches, you’re going to be hard-pressed to find an electric skateboard that’s more portable. It’s also worth noting that the R1 Elite also comes with headlights and taillights, which allow you to cruise long into the night — but the review board we tested unfortunately didn’t come with them attached. Still, that’s definitely a nice option to have. It took us about three hours to fully charge the R1 Elite, but the company does offer up a 90 minute fast charger at an added price. It takes a while to charge the battery, but that’s not wildly uncommon for electric boards of this size. 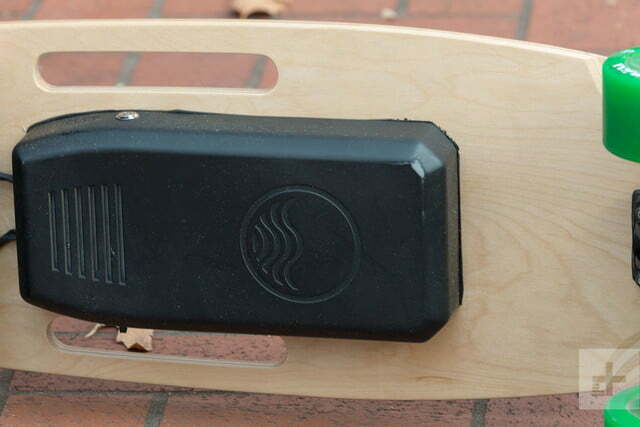 As an added bonus, Riptide claims that the board fits TSA’s increasingly strict guidelines, which means the R1 is airplane safe and can fly with you. 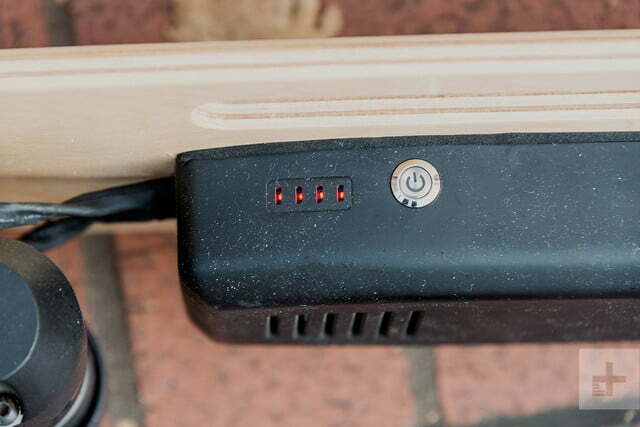 The battery is secured with a heavy-duty case that’ll protect against damage, and although it’s not waterproof, the case can easily withstand a dash through the occasional puddle after a rainy day. The wireless controller feels good in your hand, and the board’s motors are highly responsive to your control input. During our testing, the toggle stick for acceleration never got stuck in one position, and was generally quite consistent and reliable. It is, however, a little more complicated than most controllers, thanks to the R1’s two speed options: standard mode and pro mode. Standard mode gives you a max speed of 12 mph, while pro mode goes up to 20 mph. The software could be tuned a bit better though. If you decide to transition from Pro to Standard mode (or Standard to Pro) while you’re riding, you’ll experience a little bit of jerkiness. 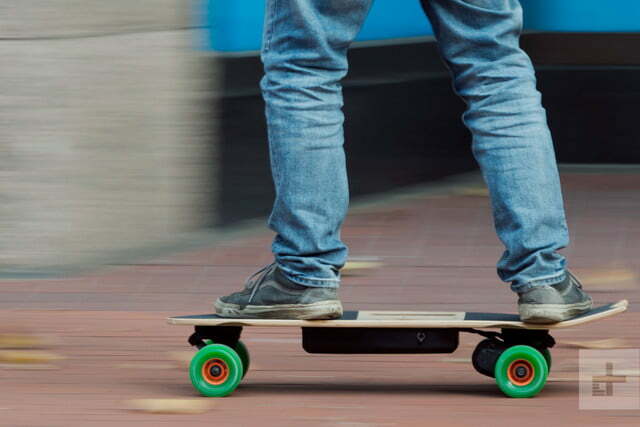 The amount of jolt you’ll feel from under your feet will vary depending on what speed you’re traveling at, but after a couple of trial and error moments, you’ll get the hang of the board’s movements and understand the way it behaves under your feet. All in all, the board’s responsiveness to your controls is almost instantaneous, but that’s not always a good thing. Smoother acceleration/deceleration would go a long way toward making the Riptide R1 Elite feel less squirrelly, and more approachable to novice riders. A common problem with electric boards is their brakes (looking at you, Tomahawk), and unfortunately the R1 is no exception. The deceleration system on Riptide’s board isn’t bad if you’re cruising at lower speeds, but the faster you go, the more difficult it becomes to slow down comfortably. While we never felt like we were going to be thrown off the board, it did take a few rides to get used to the braking system’s abruptness. If you decide to buy the R1 Elite, we highly recommend taking the time to get used to the brakes before you ride in unfamiliar territory with unpredictable obstacles – a.k.a. public streets and sidewalks. Like we mentioned earlier, you can tell this board was built by skateboarders, and it shows in the little details while riding. For example, you don’t have to manually turn on the board before you ride. You can just set it down, kick forward a couple of times, and the R1 Elite will automatically turn on. The shape is also great. Since the deck is built like a typical cruiser, it’s short and snappy, with a torpedo-shaped taper that provides ample foot space. More and more electric skateboards are trying out innovative designs, but nothing feels better than a good old-fashioned wooden deck. Since most electric skateboards are typically designed as longboards, they’re usually a bit tricky to turn with — but the R1 Elite’s shorter wheelbase and playful kicktail make quick turning a breeze. 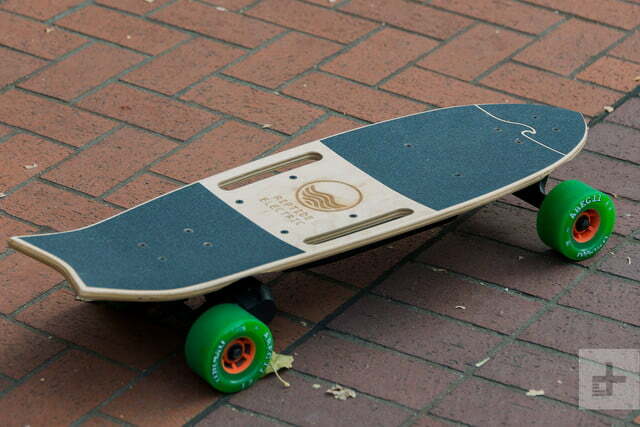 Even with the board’s added weight, it’s astonishingly easy to whip around and make sharp, controlled turns. In pro mode on the R1 Elite, you can go up to 20 mph, which is fairly standard fare when it comes to electric skateboards. The Elite can sort of hang with the best of them, but is at its best when you’re hovering around 12 to 15 mph, because you can safely take advantage of the kicktail at lower speeds. The major downsides with the R1 Elite are the exact same problems that you’ll find in a lot of mid-level electric skateboards. The back wheels are strapped to belts, so it’s difficult to push off the board and coast if there’s no power, and the motor puts off a pretty loud hum while you ride. Just keep in mind that if those downsides are deal breakers for you, then electric boards probably aren’t for you, since pretty much all of them are relatively loud and bad at coasting. The R1 Elite is fun to ride because it feels exactly like a regular cruiser board, but with the added benefit of an electric motor that can propel you up to 20 miles per hour at the push of a button. Going back to basics and adding a simple kicktail on the board really makes for an unforgettable ride every time you hop on, and the handles on both sides of the board also make the Elite arguably one of the best commuter boards we’ve ever ridden. 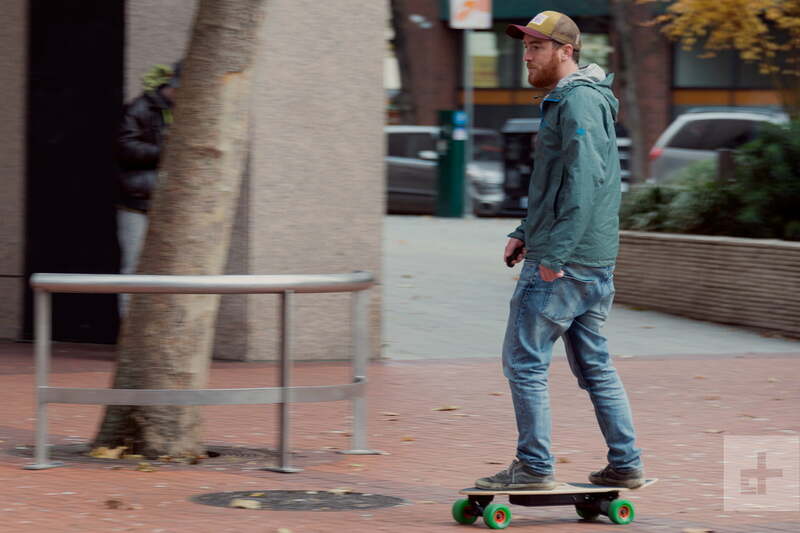 So whether you’re an avid skater or someone who’s just looking for a new way to get to work, Riptide’s R1 Elite offers a blend of ride and portability that’s hard to beat. If you’re interested in riding one, Riptide just finished up a super successful Indiegogo campaign where it surpassed its fundraising goal by nearly 200 percent. The R1 Elite is now available through Indiegogo InDemand for $729.